I wrote about the AquaTech Base housing system when it was released a few years ago. A couple of months ago I bought one myself, to check out what a modern DSLR housing feels like, so I could talk about it for my upcoming surf photography course. Once I had it in my hands, I realised that the housing shell was now the same for nearly all the models of housings that AquaTech offered. I always knew that they were pretty similar, but this is the first Base housing that I had handled myself. I get emails from lots of people asking for recommendations on the best water housing for their needs, and AquaTech comes up a lot in those discussions. I haven’t been keeping up to date on their range so I have to look at their site every time I get an email to see what they’ve got. 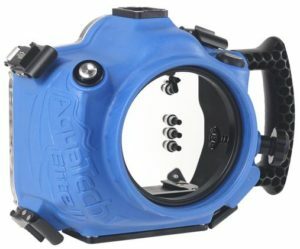 When I got an email from AquaTech about the new AquaTech Base II and AquaTech Elite II water housings, I decided to look into their range of housings in more detail. This post should answer a lot of questions people might have about the range. What’s the difference between AquaTech’s Delphin, ATB, Base, Compac, Elite, Base II and Elite II water housings? The ATB series – for small, mirrorless camera bodies like the Sony a6xxx range and some Fuji X mount cameras. The Base/Compac/Elite series – for most camera bodies. The new Base II/Elite II series – for most camera bodies, with some updates. The ATB housings take the older, smaller, L series ports, the others take the newer, bigger, P series ports. The Base, Compac and Elite housings all feature the same materials and basic design, but the Elite housing shells are blue, whilst the Compac and Base versions are red. It looks like AquaTech are simplifying their range of housings going forward. That means they’ve got all of these options currently available on their website, but in the future I expect they’ll remove the original Base and Elite models. *I’m not sure what the new top plate is for, but it’s in the new photos for the II series housings, and it’s not in the others. The new Elite II and Base II housings won’t be compatible with the Pole shutter kit, as they don’t use the same pistol grip system. You may find that some of these models are sold out, and there are some models that were once available and are no longer listed on the site. As AquaTech have many dealers around the world, I’d check with your local authorised dealer, or AquaTech themselves, for availability and up to date prices. I’ve put the list of camera manufacturers in the same order as AquaTech’s website, they list Canon first, Sony second, then Nikon. This might suggest that they’ve seen an increase in demand for Sony camera housings over Nikon, but that Canon is still the top seller. The fact that they’ve got a brand new housing listed for the Canon 7D (released in September 2009! ), is remarkable. The number of Canon bodies that are compatible is testament to their dominance of the surf photography world over the last few decades. What’s the difference between the old Aquatech Base and Aquatech Elite housings and the new Aquatech Elite II and Aquatech Base II housings? The main difference between the old Base and Elite housings and the Base II and Elite II models is the shutter release buttons and pistol grip. On my original Base housing, and the majority of older AquaTech housings, there’s a pistol grip with a waterproof connector on the outside for a wired shutter release button. The pistol grip on the original base housing has two buttons, one for focus and one for shutter release. I like this design, but I can imagine that it’s not intuitive for anyone who is used to operating the focus and shutter with the same shutter button. You can see what separating focus from the shutter feels like by setting up ‘back button focus’ on your camera, and seeing if you like it or not. The new pistol grip makes use of a new electronic shutter control button on the bottom of the housing. AquaTech imagine people will use this button without the pistol grip, so you can shoot with the camera in portrait orientation by pressing the button on the bottom (now side) of the housing. I’m not sure it would get much use without the pistol grip. It doesn’t seem like the button on the bottom has any advantage over the one on the top for portrait orientation shots. This image compares the traditional portrait orientation shooting style (this shows a Canon 5D mk iv with a battery grip), with the housing in portrait orientation. It doesn’t look ike it would offer a more comfortable position, and the bottom button wouldn’t have the advantage of the textured grip on the top, although the metal surround for the button might provide some grip for the fingers. I haven’t tried it myself, so it might be a real improvement over just using the pistol grip, or regular shutter button. The bottom button is recessed inside what looks like an aluminium bracket on the bottom of the housing, and there’s a new top plate on the top too. The height and weight listed are the same for the old AquaTech Elite housing and the new Aquatech Elite II housing. Maybe these add-on parts aren’t included in those measurements. I think the bottom bracket is there to protect the button and prevent it being pushed accidentally, as well as to provide a solid mounting place for the new pistol grip. The new pistol grip uses a similar approach to the AxisGo pistol grip, which used a lever mechanism to push the button on the edge of the AxisGo iPhone housing which pushed the volume control button on the phone, to take a photo. This time the lever doesn’t push a mechanical button, but an electronic one. I’ve used the AxisGo pistol grip a lot, and it works really well, and this one has added padding and a more substantial look to it. These changes make sense as the AquaTech Base II and AquaTech Elite II housings will be a lot heavier than an AxisGo. The grip is attached using 4 bolts. I’m curious about the way it attaches to the housing. Based on the photos on the AquaTech site, the grip can pivot forwards 90 degrees. I thought this might be the only way to allow all four bolts to be tightened, but I don’t think that’s the case. My best guess is that it somehow allows you to use this pistol grip with the AxisGo series of housings too. by ignoring the front two bolt holes (not needed for the AxisGo as it’s so much lighter), you could use two bolts to attach this same grip to an AxisGo. That way you could buy one grip and use it with your iPhone and DSLR/mirrorless housings. Naturally, it would allow AquaTech to make some savings on manufacturing pistol grips if they’re all the same design. If someone reading this gets one of the new housings, and has an AxisGo housing, I’d love it if you could check if it works with an AxisGo. 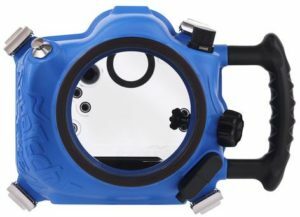 The AquaTech Base II and AquaTech Elite II water housings both use the P-series lens ports. They are compatible with all the existing P series ports. AquaTech have also introduced a newer version of the P-series ports which are “lighter, stronger and more durable than ever before”. The new flat ports are slightly more expensive than the old P-series ports, coming in at $215 for the short flat ports and $259 for longer lengths (compared to $195 and $245 for the old ones). The new PD-140 dome port is $695 – which is a fair bit more than an old style p-series dome ($395 – $495 depending on size), but it does have a unique shape with a flared tube to accommodate ultra wide angle zoom lenses. What’s the difference between the Aquatech Base II water housing and the Aquatech Elite II water housing? As you can see from the table, the differences are the items that are bundled with the housing, the back plate that’s supplied and the colour of the housing. The AquaTech Base II housing comes with the new M3 pistol grip and the new style P-65 flat port included. 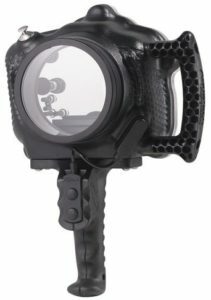 The AquaTech Elite II housing does not come with a pistol grip or a port. 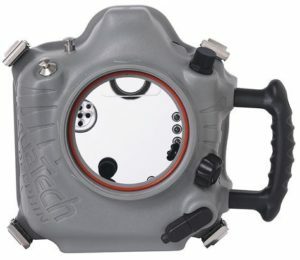 The Aquatech Base II housing has a basic back plate with no controls. The AquaTech Elite II housing has all the controls you could need on the back plate that’s supplied with it. 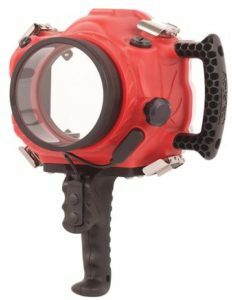 The Aquatech Base II housing is red. The Aquatech Elite II housing is blue. Otherwise, I’m pretty sure, the two housings are identical. I might be missing something though, so please let me know if you know of any other differences. You can buy the M3 pistol grip separately, for $199 (much less expensive than the V1 pistol grip at $395, which included the waterproof switch and cable). 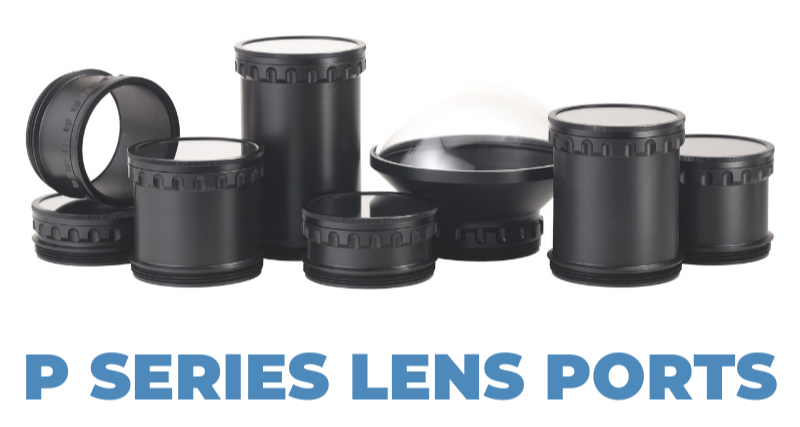 And you can buy the P-65 lens port for $215. You can also buy a ‘conversion kit’ which is compatible with any Base, Compac or Elite housing (original, or version II), and includes a back plate with camera controls, a camera plate and the cable you need for the shutter release. The conversion kits are $795. If we take the Sony A7RIII (The A9 and A7III are the same size so will also work) as an example of a camera that you can use in an Aquatech Base II housing, or an AquaTech Elite II housing, here’s the cost breakdown for a water housing with full rear controls, pistol grip, and flat port. 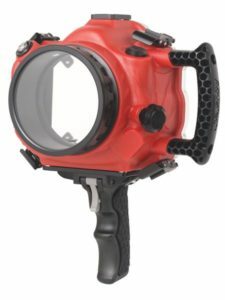 In that situation, provided you don’t mind having a red housing, you get the same housing kit, plus an extra back plate and camera tray, for $219 less. This depends on the availability of the conversion kit for your camera model. There might be other differences that I’m not aware of that mean the Elite is a better option. Please let me know if you know any other differences and I’ll update this post. There’s also a conversion kit for the Nikon D5, but that’s only compatible with the bigger Delphin housings. Should I buy an Aquatech Base II or Aquatech Elite II water housing? If you’ve got a Canon EOS R, Fuji X-T3, or a Panasonic GH5, and you need rear camera controls (you probably do need at least some of these controls), then go for the AquaTech Elite II housing, and get a pistol grip and port. 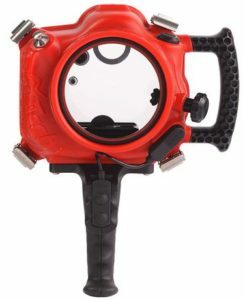 If you have a camera that has a conversion kit available, I’d go for the Aquatech Base II housing with a conversion kit. 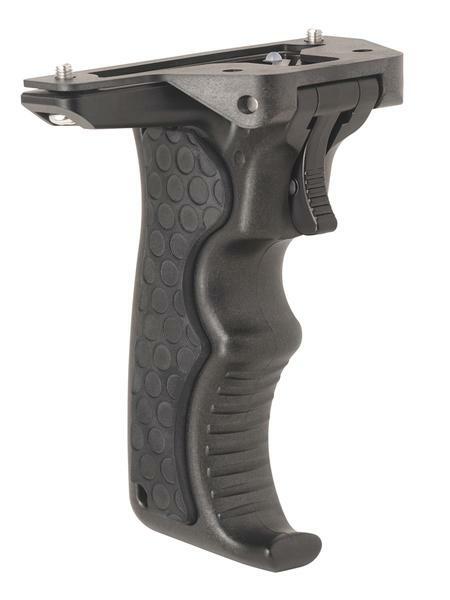 If you’ve already got an AquaTech Elite model but you really don’t like the separate focus and shutter buttons on your current pistol grip, then I’d also recommend the Aquatech Base II housing. You can swap your camera tray, shutter cable and back plate and you’re good to go with the new M3 grip. If you really don’t think you’ll need a pistol grip, then you probably don’t need an AquaTech housing. If you’re set on an AquaTech and you don’t want a pistol grip, I’d probably still go for the AquaTech Base II housing and conversion kit (if your camera is supported). You don’t have to use the pistol grip, and you’ll only save a few dollars by going for the AquaTech Elite II model. If you’ve got an existing Aquatech Base housing, you’re probably more budget conscious than the Elite housing users, so I’d recommend sticking with what you’ve got. The old AquaTech Base housing kits look like especially great value at $795, although there are only a handful left. If you’ve got one of the new AquaTech housings, I’d love to hear how it performs. You can leave a comment below this post, or send me an email at ben@learningsurfphotography.com. If you’ve arrived here but you don’t have a camera or you’re not sure which camera or housing to go for when starting to learn surf photography, check out my recommended surf photography gear page, updated for 2019.